Based in Vernon, BC since 1985, Anser Manufacturing brings more than three decades of passion, skill and dedication in creating its industry-leading line of logging truck trailers. Designed and built in BC, our products meet the challenges faced by drivers in our woods and on our roads, every day. As a logging trailer manufacturer and distributor, Anser caters to independent operators, dealerships and everyone in between. Our products have earned a reputation for delivering performance and durability to ensure drivers enjoy maximum uptime, efficiency and profits. A regular fixture at Anser Manufacturing since he held the role of office cleaner at age 12, Matt knows this company inside and out. When he was finally allowed on the shop floor at age 15, he showed a real knack for steel fabrication and quality control, eventually earning his journeyman ticket. Along with his dad and business partner, Hank Kamerbeek, Matt oversees the operations at Anser, and a number of other family-run ventures, including Mid-Kam Manufacturing, a structural steel building company, and H.J. Kamerbeek Construction. Hank acquired Anser Manufacturing in 2001, selling it to Matt when he was old enough to take over the company. While he remains involved with Anser as a partner, his primary focus lies with Mid-Kam Manufacturing and H.J. Kamerbeek Construction. Hank continues to be a tremendous resource and mentor to Matt, drawing on more than four decades of experience as an industrial contractor. A heavy-duty mechanic by trade, Bruce handles the installation of air and electric components on all Anser logging trailers, as well as some office duties. Starting his apprenticeship right out of high school, the Vernon native has more than 40 years of experience in the field, working as an independent service contractor before joining Anser in the 1990s. When Dan Chambers sold Anser Manufacturing to Hank Kamerbeek in 2001, Bruce stayed on with the team. Growing up in Armstrong, BC, Erik started with Anser Manufacturing in 2000 while he was still in high school. He’d come into Vernon after class, and on weekends, to sweep the floors and help out around the shop. A journeyman steel fabricator since 2004, he has more than a decade of experience in building Anser logging trailers and is involved in the entire production process. From fabricating and welding to assembly and rigouts, he does it all. At Anser Manufacturing, being the best doesn’t mean being the biggest. We believe in putting in the time to produce quality logging trailers that meet our exacting standards…so that they exceed yours. Nothing leaves our shop until it’s perfect, and we stand behind everything we build. Headquartered at our easily accessible facilities on Fairweather Rd. in Vernon, BC, Anser Manufacturing produces, distributes and services its logging trailer products all in one convenient location. Anser Manufacturing is one of three family-run enterprises operated by the father-son duo of Hank and Matt Kamerbeek. The other two are Mid-Kam Manufacturing, a structural steel company, and H.J. Kamerbeek Construction, which specializes in both commercial and industrial building projects. We feel that this level of diversity gives us an important competitive advantage: the ability to adapt. Not only does it ensure our workforce has the skillset to tackle any project, it also gives us tremendous flexibility when coordinating manpower for any particular project. As demands change, we have the ability to adapt our workforce accordingly. Founded by Hank Kamerbeek in 1976, H.J. 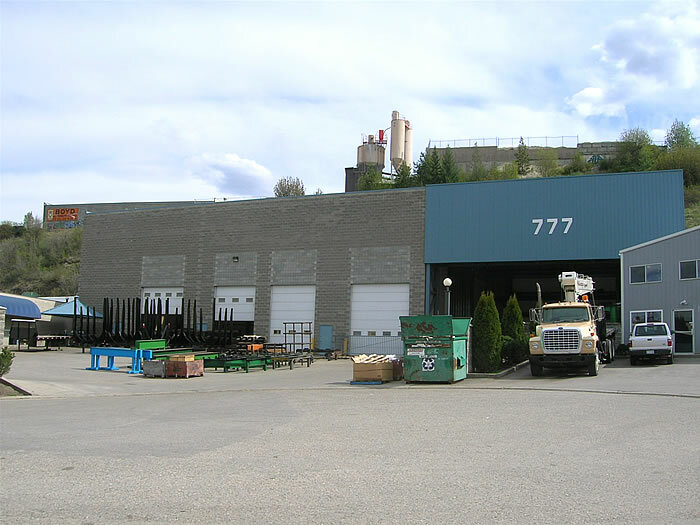 Kamerbeek Construction specializes in both commercial and industrial building projects across BC and Alberta. Using highly skilled tradesmen, the company places a focus on precision, reliability and quality. Anser Manufacturing started in 1985 under the direction of Dan Chambers, formerly of DCT Chambers Trucking in Vernon. Over the next 16 years, he built the company up until Hank Kamerbeek acquired it in 2001. Since that time, Hank and his son, Matt, who now heads the company, have continually improved the Anser product line using a combination of high-end parts and materials, as well as the use of 3D solid modeling software and Finite Element Analysis (FEA). Every Anser trailer design is engineered and stamped to ensure it meets our customers’ needs, and our uncompromising standards for quality. Logging trucks have come a long way since the first primitive versions were used in the forests of Western Canada in the 1930s and 40s. With tree harvesting sites becoming increasingly remote in modern times, trailer manufacturers like Anser have had to develop models capable of negotiating a range of physical barriers, including steep grades, single-track roads and poor ground conditions. Anser Manufacturing has helped meet increasing demand for hauling short logs with its tri- and quad-axle short loggers. By increasing the number of axles, it increases the average payload of the tractor/trailer unit, which results in higher profits at the scales. Whether we’re fabricating a logging trailer at the Anser Manufacturing shop, or we’re erecting a structural steel building on a jobsite with Mid-Kam Manufacturing, we place a major emphasis on workplace safety. Each of our companies is fully insured, and we follow a strict set of protocols to foster a safe and healthy work environment. We operate with a highly experienced team of employees who have the skills and training to properly operate the tools and equipment needed to complete jobs safely and efficiently. Because of this, we have established an exceptional safety record.